The San Francisco Bay Area is in the midst of a strong recovery from the past decade’s economic downturn. However, the benefits of prosperity are not universally shared. In the Bay Area, more than 1.1 million workers — over a third of the total workforce — earn less than $18 per hour. How can we make sure the region’s rising economic tide does more to lift all boats? 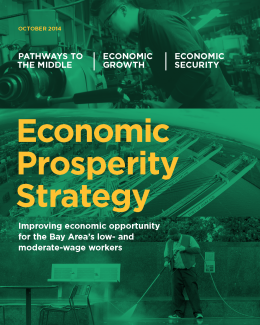 The Economic Prosperity Strategy identifies a comprehensive, three-pronged approach to providing greater economic mobility to low- and moderate-wage workers in the Bay Area. First, create pathways that will help lower-wage workers move into middle-wage employment. Second, promote economic growth with an emphasis on middle-wage jobs — to ensure that there are sufficient opportunities for moving up. And third, improve the quality of jobs and economic conditions for lower-wage workers.